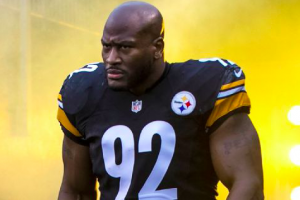 It didn’t take long for James Harrison to land on his feet. Less than three days after being released by the Pittsburgh Steelers, Harrison signed a deal with the New England Patriots. The move is not all that surprising. The Patriots have been known to sign veteran players who find themselves on the open market, and they’ve done so again with Harrison in hopes of addressing an area of need. The Steelers released Harrison mostly as a procedural move to add another offensive lineman to their roster. Harrison had also fallen out of favor in Pittsburgh’s linebacker rotation this season. He has rarely played this season, as the Steelers have four other outside linebackers on the depth chart ahead of him. Despite that, there was speculation that Harrison would end up back in Pittsburgh after he cleared waivers on Monday. But after visiting with New England on Tuesday, Harrison has signed with the Patriots. He’ll now have a chance to chase his third Super Bowl ring with a new team. On the surface, it appears likely that Harrison will see more playing time with New England’s defense. With Pittsburgh running a 3-4 defense and New England employing a 4-3 defense, Harrison could potentially be used as either a pass-rushing defensive end or outside linebacker with the Patriots. The Patriots don’t have a lot of depth at defensive end. Behind Trey Flowers, New England only has Eric Lee and Deatrich Wise, so Harrison could be useful in that role. At outside linebacker, the Patriots typically employ David Harris and Kyle Van Noy. However, Van Noy has missed the team’s last three games. Marquis Flowers has helped fill the void for Van Noy during that time. It should be noted that the Patriots released linebacker Trevor Reilly to make room for Harrison on the roster. That could point to Harrison seeing action at linebacker for the Patriots. Either way, the Patriots have a bigger need for someone with Harrison’s skillset, so he could see regular snaps for New England’s defense during the playoffs. Regardless of how he’s used, Harrison’s late-season team switch adds an interesting subplot to the AFC playoffs. The Patriots and Steelers are viewed as the top favorites in the AFC. The two teams are expected to eventually face each other in the AFC Championship Game. If that ends up being the case, the long-time Steelers linebacker will face his former team for the right to go to the Super Bowl. Harrison has already won two Super Bowls as a member of the Steelers. Ultimately, Harrison doesn’t move the needle much for the Patriots. At age 39 and without much game action this season, it’s questionable if Harrison still has enough left in the tank to make an impact. But for the Patriots, he’s worth the risk. Not only does he fill a position of need, he also brings veteran leadership to the table. If nothing else, his move to New England adds an interesting twist to the upcoming playoffs.